The SNHR announced in its report released today that at least 191 chemical attacks in Syria should be on the agenda of the OPCW after its new mandate. In February 2019, the Organization for the Prohibition of Chemical Weapons (OPCW) is expected to exercise the powers of its new mandate to identify the perpetrators of chemical attacks. This follows an amendment of its previous mandate, which lasted over two decades since its establishment on April 29, 1997, but which was limited to confirming the use or non-use of chemical weapons, without identifying the perpetrator responsible. As the report explains, there are two main reasons for reviving a crucial debate on this issue concerning Syria, and for expanding the OPCW’s mandate: first, the extensive and repeated use of chemical weapons by the ruling regime against the Syrian people. Second, Russia’s suspension of the extension of the joint international investigative mechanism in Syria established by Security Council resolution 2235, with one of this body’s functions being to identify the user of chemical weapons. The nine-page report reveals Russia’s attempts to thwart this new mandate, noting that Russia has effectively sent a message to all the world’s countries that it will use or protect those who use chemical weapons. This is the policy Russia has followed with its ally, the Syrian regime, over the past eight years. The OPCW began its work in Syria following the accession of the Syrian regime to the Chemical Weapons Convention in September 2013, thus, as the report explains, all the chemical weapons attacks in Syria prior to this date, were not covered by the OPCW’s remit, including the infamous attack on the two Ghouta in August 2013. Moreover, all the attacks that have followed this date, which the OPCW has worked to assess, remain officially unattributed to any specific party. As the report states, at least 221 chemical attacks were carried out between December 23, 2012, and December 31, 2018, documented by the SNHR. The Syrian regime carried out at least 216 attacks, while ISIS carried out at least five attacks. Collectively, these attacks resulted in the deaths of at least 1,461 people. The report refers to the methodology adopted in documenting these attacks, stating that it has relied on a wide network of relationships built up over years, and on accounts of survivors and eyewitnesses as well as doctors who treated people injured in chemical weapons attacks, and Civil Defense members who rushed to save those affected by the attacks. The report also includes the results of an operation to cross-reference 43 incidents that the Organization for the Prohibition of Chemical Weapons (OPCW) has confirmed in its investigations cited in its reports with those documented on the SNHR database. The results show that there is a match in 30 of the attacks recorded, with 28 of these attacks carried out by Syrian Regime forces, while the other two were carried out by ISIS. On this basis, the report notes that a further 191 chemical weapons attacks documented on the SNHR’s database have not been investigated by the OPCW. These attacks are documented in great detail, including information such as time, place, type of munitions used, number of injuries, victims, etc. The report stresses that there are fundamental challenges facing the work of the OPCW in Syria, noting that the Syrian regime has deliberately obstructed the work of the OPCW and misled its investigators repeatedly, as well as obstructing the granting of visas to certain OPCW personnel and deliberately delaying responses to its messages, in addition to other obstacles such as hindering the access of inspectors to some areas. There are additional fundamental challenges that go beyond the limits of logistics, the report explains. The most prominent of these challenges stem from the fact that the chemical attacks occurred a long time ago, meaning it is very difficult to collect evidence, particularly material evidence, such as material evidence of the effects of gases on the soil or the remnants of missiles and weapons used, especially as 80 percent of the attacks occurred within areas recently captured by Syrian regime forces and Iranian militias. In this regard, the report notes that the systematic displacement of the population from most areas that were attacked with chemical weapons previously will make it very difficult for the OPCW to gain access to eyewitnesses or survivors of attacks, medical personnel who helped to treat the injured, or to review the records of hospitals and medical centers, which provided treatment for victims of chemical attacks. In addition, those who remain in the areas under the control of Syrian Regime forces will not dare to give any evidence that might contradict the official narrative of the Syrian and Russian regimes. 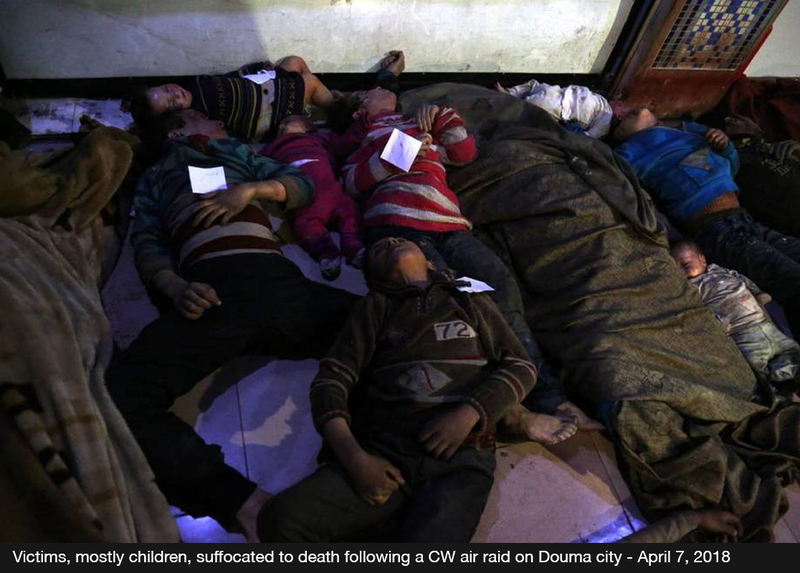 The report notes that the Syrian regime has manipulated the remains of many victims of chemical attacks, as happened in the cemetery of Douma city, where the bodies of the victims were disinterred and moved. While this tampering with the crime scene and removal of victims’ remains are clearly actions which condemn the Syrian regime, they make investigation difficult for the OPCW team. The report calls on the countries of the civilized world to stand up to states that support the use of chemical weapons and the concealment of evidence of their use, the foremost of these states being the Syrian, Iranian and Russian regimes, to provide all possible support to facilitate the work of the OPCW in Syria, to expose the manipulations of the Russian and Syrian regime, to take serious action to hold accountable anyone found to be involved in the use of chemical weapons, and to support the active human rights organizations in documenting the use of chemical weapons in Syria. The report stresses that the permanent UNSC members must cease using their veto power to protect perpetrators of war crimes and crimes against humanity, in particular the use of chemical weapons, also, that Russia must cease its exploitation of its role as a permanent member of the Security Council in the context of supporting oppressive dictatorships in exchange for material and political interests at the expense of the killing or displacement of millions of people. The report recommends that the OPCW expand coordination and cooperation with relevant human rights organizations in documenting the use of chemical weapons in Syria, and calls on the UN Human Rights Council to make greater efforts to highlight the use of chemical weapons by the Syrian regime.